This indicator circuit will monitor battery voltage. It's simple circuit will avoid confusing when assembling and not prone to malfunction during operation. The circuit consumes about 0.43 mA current at a voltage of 12 volts, power is about 0.00516 watts. Because that power consumed is very small then this indicator can be used to continuously monitor the voltage, for example as an indicator vehicle dashboard. LED lights as accessories that can adorn the dashboard. See video when testing with variable voltage power supply here. Watch test video on vehicle for battery voltage and electric system interpretation, please read "Battery And Charging System Condition Interpretation By Voltage". The circuit is using zener diode as voltage reference and it is known to have good stability and high accuracy. The circuit is quite reliable yet inexpensive when compared to the expensive digital voltmeter but sometimes error, as well as analog voltmeter which is less accurate when placed in a certain position. Maximal voltage for charging dry cell battery) is around 13.8 volts. Maximal voltage for charging wet cell battery is around 14.4 volts. More details on "Charging Your Vehicle Battery". In addition to monitoring the vehicle battery voltage, the circuit can also be used for battery charging indicator with wind turbine (wind charger) as the article "Pico Wind Turbine With Bicycle Wheel". Resistor 1 (R1) is 10 kiloohms 0.5 watts, it filters high voltage caused by magnetic field induction alternator, dynamo, and transformer that is used to recharge battery. Diode 1 (D1) is 1N4007 securing the circuit if there is an error connection to the battery. D1 will cause voltage that is fed to the circuit will be dropped 0.6 volts. R1 and D1 may be omitted if the circuit operation is considered fairly safe. If D1 abolished then all values of zener diode must be added by 0.6 volts. Zener diode 1 (Dz1) has value 11 volts 0.5 watts, will determine the voltage that makes the transistor (T) turned on and LED light up. Note that zener diode is installed with reverse position of ordinary diode. Base resistor (Rb) with value 680 kiloohms 0.25 watts determines the current through transistor and the LED to adjust the brightness of the LED when lit. LED has a 5 mm diameter with transparent casing and yellow light. If using a crystal diode OA90, then the zener voltage can be increased by 0.2 volts. This circuit can be modified so that the LED is turned on at a certain voltage, by replacing zener diode, or add 1N4007 or OA90 diode on the transistor base as shown by the rightmost circuit. Number of LED lights also can be added as needed. 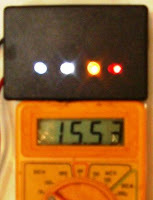 To monitor battery voltage, circuit should consist of 4 pieces LED lights representing 12, 13, 14, and 15 volts. LED light representing 14 volts should be orange colored, to warn that the battery voltage is maximal for wet cell battery, and too high for dry cell battery. LED light representing 15 volts should be red colored, to warn that the battery voltage exceeds the maximum voltage allowed for wet cell battery. For voltage indicator circuit of 12, 13, 14 and 15 volts, it is using zener diodes 11, 12, 13, and 14 volts. Zener diodes voltage are a little smaller, because of the loss of voltage on the input diode (D1) and the base emitter transistor respectively of 0.6 volts, so the total loss of voltage is 1.2 volts. For 24-volt battery, circuit is using zener 22, 24, 26, and 28 volts. If you can not find the appropriate zener voltage, it can use a 1N4007 diode (0.6 volts) or OA90 crystal diode (0.2 volts) to adjust or increase the zener voltage. Below photo shows voltage indicators unit which has different LED lights, which are: white for 12 and 13 volts, orange for 14 volts, and red is indicating 15 volts. Those white LEDs are very bright while red LED is the faintest. It won't be a problem for high current consumption at 15 volts, as it means that charging system is over voltage. Therefore it needs load to consume that excess voltage. As a guidance to set the LED brightness, forward voltage at LED pins (anode and cathode) should be about 2 volts to produce bright LED light, and LED will last longer. If the forward voltage exceeds 3 volts, the LED can be broken. Photo above looks out of focus because the camera lens is dazzled by the light of white LEDs. That's why white LEDs are using very big resistors. If the circuit is using only white LEDs, current consumption will be very very small.